When Chad Simpson last appeared at Lucas Oil Speedway, it was a time of joy. The veteran driver from Mount Vernon, Iowa, captured the season-ending Lucas Oil MLRA Fall Nationals feature last October, and with it a series championship. Simpson's family, crew and car owners Bud and Denise Brinkman savored a memorable trip to victory lane at the Wheatland, Mo., oval. But it also kicked off a period of uncertainty. The Brinkmans had announced early last year that they were retiring from the sport at season's end, leaving Simpson without firm racing plans for 2019. Not until shortly after New Year's Day — after three prospective deals with new car owners fell through — did Simpson decide to forge onward by putting together his own deal. He's purchased the cars and motors from the Brinkmans and will be back at Lucas Oil Speedway on Friday when the new Lucas Oil Midwest LateModel Racing Association season opens with the sixth annual Spring Nationals Presented by RacingJunk.com. 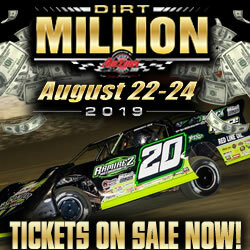 "It's going to be tough to do the points deal because of my work schedule," Simpson said of a possible MLRA repeat bid. "I would love to. That's been my bread and butter, to do a little points racing and get excited about that. It kind of gets everybody focused. But this year we're probably gonna have some restrictions with work and stuff. "We're just going to go to Wheatland and see what happens the first weekend out. We'll kind of chase it week by week from there and see what we can do." The Spring Nationals has full programs Friday and Saturday capped by $3,000-to-win features for the Late Models. Anticipating cool weather, the track has moved up start times one hour with gates opening at 3 p.m. and racing at 6:05 each night. Simpson said he and the Brinkmans, whom he won 13 titles with in various series over 15 years, remain close friends. Bud Brinkman has stopped by the race shop numerous times and have been helpful in getting the financial details worked out in transfer of team ownership. But the winter was a bit stressful as the uncertainty lingered. "We did some searching after the end of the season up until about Christmas," the 40-year-old Simpson said. "We made some contacts and talked to a lot of different people and really had two or three deals put in place that all sounded really good and thought we had things worked out. Then all three of them fell through. "By Christmas, I'm normally working on the car and getting things ready for the next year by then. (Instead) I had everything just sitting there. I finally sat down with Bud around Christmas time and talked to him about buying the stuff myself and going out on my own. Right around first of year, I made a decision that I was going to start working (on the car) and I was going to figure out, one way or another, how I was going to do it." Prospects for 2019 became even better within the last couple of weeks when Simpson reached an agreement with Moring Motorsports to drive that team's No. 1 car in select crown jewel events for car owner Larry Moring and crew chief Ronnie Stuckey. "I've been talking with Ronnie and Larry quite a bit this winter, on and off," Simpson said. "Ronnie was sick for a while, so put that stuff on hold for a little bit. Just putting something together with those guys, that helps me a ton financially. "I've always known Larry to have the best equipment. It's a real honor to be in his stuff for those races. He's had some real top-notch drivers and I feel really blessed." "The goal when last season started, when we decided that we were going to do one more year together, Bud told me he was going to get me the equipment that I needed to win the championship and he did," Simpson said. "We put out a goal to win the championship and bring that home for them in their last run with us. "I finally sat down with (former car owner) Bud (Brinkman) around Christmas time and talked to him about buying the stuff myself and going out on my own. Right around first of year, I made a decision that I was going to start working (on the car) and I was going to figure out, one way or another, how I was going to do it."